NAACP leaders thought that a statue of George Washington just didn't seem to fit in with Martin Luther King day celebrations in Columbia, South Carolina. 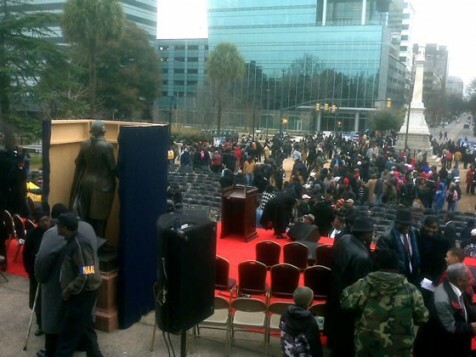 The NAACP decided to cover up a statue of George Washington during a Martin Luther King day event outside the Columbia, S.C. statue house because they thought the statue didn’t look good as a back drop for speakers on stage. The father of the United States was covered up by a coffin like, wooden box. The NAACP has unsuccessfully tried to cover the statue in the past, but this time they suceeded. Marcus is black and thinks that the NAACP should spend more time fixing problems in the black community. The NAACP said that the reason George was covered up was because the structure covering the statue was to be used as a backdrop for speakers with graphics, which was not finished in time for the rally, so they just left it where it was. My son & his wife stationed in Europe relate that pure-bred, well-off Whites in Germany(a Civilized nation vastly enriched by inventive & manufacturing know-how undebased by black deadbeats) NOW ask US troops on TV why white Carolinians didn’t fasten a clothespin on George’s nose to block-off the stench of surrounding in-breds !